One of the great pleasures of our trip to the Midwest a few weeks ago was the number of Soras that we saw at one particular spot at Horicon Marsh. Soras are a once a year type of bird for us, generally off in the distance. One night near dusk on this trip we had three in our binoculars at the same time, just a few feet away. I only did one fieldsketch of them and it wasn't much. The photos weren't great either because Soras are very skittish. Nonetheless I got enough blurry photos to use as the basis for this page of sketches. Eventually they'll form the basis of more complete paintings or drawings. I also managed to get some more fieldsketches done the other day at Morris Arboretum. They include a Kestrel, Belted Kingfisher, American Goldfinch and Ruby-crowned Kinglet. As usual the Kinglet would not sit still and I didn't see it for long. During that time I didn't notice where the legs were. Looking later at the newest edition of Roger Tory Peterson's field guide to American birds I saw that he had them much further back than I did. So I moved them a bit here. Still need to do a fieldsketch that really focuses on this though. With all my implicit/explicit criticism of photos as subject matter for art you might be wondering what I think of video. Well I'd never even thought about it until I bought 'Winged Migration' for less than $10 and played it tonight. As I did so I sketched. For me it was great. I think because the video is dynamic it seemed more like drawing from life, better in fact in the sense that I didn't need to look through some sort of optics in order to see detail. I'd sure never want to substitute this for actually being outside. 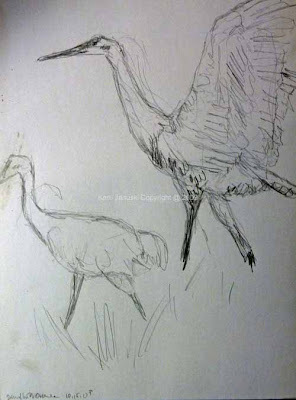 But for developing skill in drawing birds as they move about in real life, never holding still for more than a second, I thought it was really terrific! I originally was alerted to the idea of this by someone on birdforum.net saying that they used it to study bird flight. Needless to say, at least if you've seen this, it is great for that purpose as well. 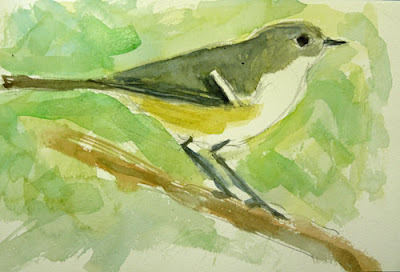 When I first started writing about my birding and art adventures about two years ago this month one of the first things I wrote about was seeing Ruby-crowned Kinglets at the Wissahickon Creek in Philadelphia. They are so oblivious to humans that they'll almost land on your head. But they don't sit still at all. As close as they are I could never do a decent drawing of one, even though one has actually wintered in our backyard for the last two years. I documented some of the problems in a previous entry. Late yesterday afternoon at about 5 p.m. I decided to try to rescue an hour out of the fast fading day for birding. I was greatly rewarded. At least one flock of 10 Ruby-crowned Kinglets was busy flitting from branch to branch. As they would disappear and I walked on I kept running into more. I debated bringing my camera. But I decided against it. Anything I saw was going to have to get recorded in my sketchbook. I'm so glad I did. 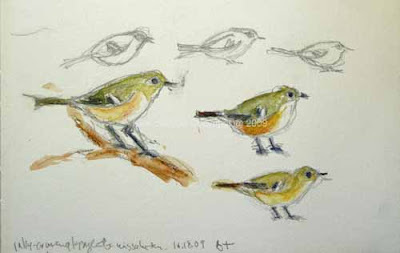 It forced me to look at the kinglets and draw them. As with my experience with Eastern Phoebes a few weeks ago no sooner would I put a mark down for the head than the bird would fly. So then I'd look for another one and continue with what I'd missed. So I think this post is aptly called 'stalking.' That really is what you do when you work from life. You know that your view won't be for long so you grab what you can then again become on the lookout for a new view. There really is something exhilarating about this. You learn to see birds in a way that you never have before. What it comes down to is that you don't just see to 'identify' but you see to 'memorize' so that you can draw from a mental image. The watercolors at top are painted entirely from a mental image(see below for why there are two versions). Both are quick, done in less than 15 minutes. They're based on the sketches I made yesterday but coupled with knowledge I picked up from looking at guidebooks and photos when I got home. Those sketches are below. I didn't use any color while I was sketching and so all of the color was added later at home. There are a lot of mistakes here. Parts of the physiognomy is wrong. Some of the colors are wrong. But it is all a learning process. Over time, if you're lucky enough to keep seeing kinglets, you finally get a good 'mental image' of them. I haven't reached that point yet. 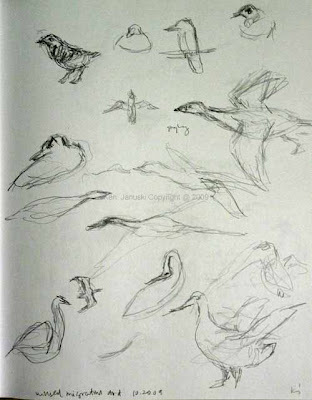 But the process is one that greatly adds to my birding and artistic enjoyment. And, FINALLY, two years after I first started I think I have a decent representation of a Ruby-crowned Kinglet, drawn from life, or at least based on sketches from life. I never guessed it would take this long. OOPS!! I kept thinking that I was doing a bad job on the wingbars. I knew that the white bar wasn't quite large enough. But the problem was more than that. If you look at the sketches I did you can see that the wing bars slant in different directions. One is correct and was drawn as I saw it. The other is incorrect and drawn from memory. Unfortunately the watercolor at top, drawn completely from memory, makes the same mistake: the wingbars slant in the wrong direction!! I've now added a very quick new watercolor with the wingbars corrected. Well that is one of the problems with working from memory. Your memory can be faulty. But still it seems better than working from photos. 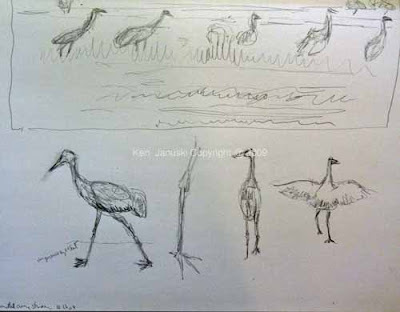 As I said some of the field sketches are correct. 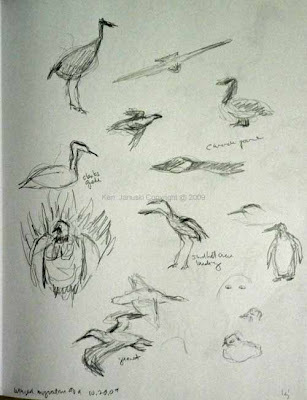 In others I must have sketched in the wingbars as I remembered them. It won't happen again! But even if it does it's not a disaster. The most important thing is to be drawing based on live engagement with the actual bird. The most troubling thing I've found with working with photos, over many, many years, is that you're engaged with a static two-dimensional representation of something. When working from life you have a dynamic engagement with an active object, fully three-dimensional and always about to move. That adds an excitement to the drawing that just can't be gotten from photos. I do think that photos can add greatly to testing the accuracy of my visual memory. But they are far better at this job than at the one of being the actual subject of my art. or at least new for the first time in about 15 years. It's been at least that long since I did any work in pen and ink. But today I felt like something new and I just didn't want to face the problem of how to deal with the foreground reeds in my usual media of watercolor, pastel or charcoal. If I'd thought about it I would have realized that pen and ink would probably be even worse but all I thought about was the excitement of trying something new. I also worked a bit larger than a lot of my recent work, 14x17 inches. I ran into a few problems, largely caused by the fact that once you put down ink it is down for good. There's no going back. So there are a few decisions I made along the way to accommodate for those mistakes. I'll let viewers figure out what they might be. Below are a couple of earlier versions of the drawing. In some ways pen and ink ought to scare most artists to death. You're stuck with whatever you put down. All mistakes stay. But I've always found it a somewhat bold and exhilarating medium. The new drawing was done with two Pitt artist pens. The drawing below from 14-15 years ago was done with a Rapidograph pen. This was done while viewing the insects under a dissecting microscope. 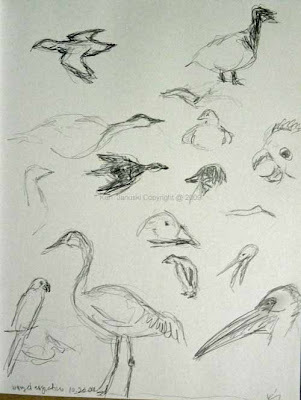 It has been about three years now since I've taken up birds as subject matter. 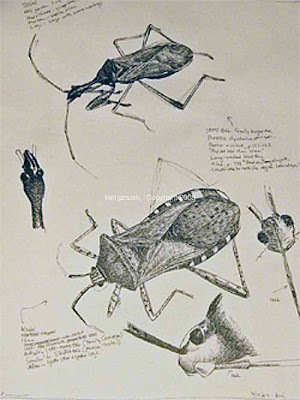 Though I have spent a couple of years drawing insects viewed under a microscope during the last 15 years that was more drawing exactly what I saw rather than creating a picture. For most of my artistic life that's exactly what I did: build/create a picture. It almost always included many studies. But they were all abstract, except for my earliest student years. The one below is from about 20 years ago. Almost all of my bird art has been based primarily on one photo that I took. So for instance I took numerous photos of Canada Warblers but each drawing or painting I did was based primarily on just one of them. Though this has the virtue of sticking to exactly what I (actually what the camera saw which is quite different) saw it is also limiting in that it is just that view. It's easy to say, 'Well I'll put in that branch, because it's in the photo', but not for any good artistic reason. More important than this is the fact photos rarely show all of the pertinent parts of the subject. I'm often missing the feet of birds, or something else. Unless I know the bird really well I have to make a guess about the missing area. This rarely works well. This is one of the many reasons for fleld sketching. 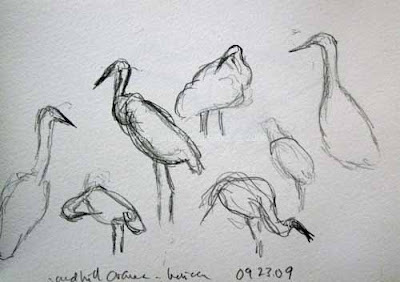 By drawing what you see you really do get a feel for the whole bird. It may not have detail but you do get a better feel for the complete bird. So I'd like to change my method of working. I've already started to do more field sketches and will continue on this path. 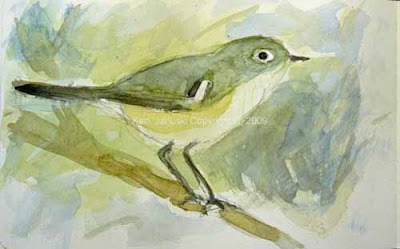 I'd also like to start doing studies for my bird paintings before leaping into them. 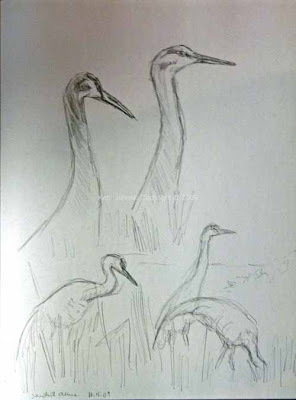 So the other drawings that are here are sketches based on photos of Sandhill Cranes that I took in Wisconsin a few weeks ago. I'm trying to get a general feel for these birds, and in particular their lower legs and feet, which are hard to see because they're often hidden by the stubble in the fields which they frequent. 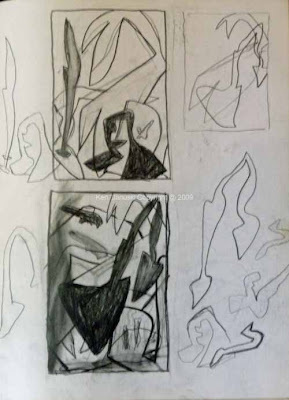 Over the next few days I'll start to compose small sketches that will be ideas for finished paintings or drawings, just like in my old abstract work. Then the big day: the one where I actually start the Better Bird Picture. Sometimes you get perfect October days. Today was one of them, sunny, clear, somewhat cool and brisk, at least early on. All in all a beautiful day to be outside, and just too beautiful to be inside, regardless of what sports might be on TV. I'm testing out a new scope. 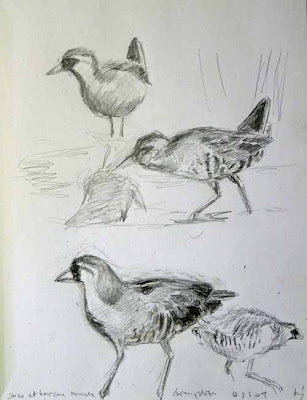 I've decided that I really need to improve upon my ancient Bushnell Spacemaster, mainly for drawing purposes, though I'll obviously use it to ID birds as well. In any case I was testing out a 60 mm today at Morris Arboretum. No sooner did I have it set up and on tripod than we stepped across the road from the parking area to the wetlands and saw a small hawk land on a dead tree in front of us. At first I thought American Kestrel but the colors were a bit off. A dark raw sienna brown rather than the rust of an American Kestrel, and none of the Kestrel's blue. 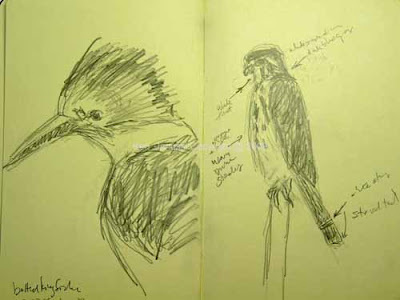 As I drew it and the sideburns immediately beneath the eye it seemed more likely that it was a Peregrine, not a Kestrel. I'm not that familiar with Peregrines, and have never seen one so close. Further study of our Sibley guide confirmed that this was an immature bird. He flew off quickly, probably after a migrating passerine lunch. We didn't see any further evidence of him until we were just about ready to leave and a large bird winged powerfully and swiftly after a songbird. The speed and power left no doubt as to what it was. The rest of the day I continued to test out the scope. But all the migrating sparrows we saw just weren't all that cooperative; here one second and gone the next. What we saw for sure: Savannah, Swamp, Song, House and White-Crowned Sparrows. What we might have seen: Lincoln's and Vesper. One bird had a lot of the buff of a Lincoln but I didn't see it long enough to see if it was also on the chest. I think it was but hate to identify a bird I'm not sure about. Another light colored sparrow, something like a Savannah, but with a pronounced white eye-ring might have been a Vesper Sparrow, a bird we've never seen. But again he was just gone too quickly. So he remains a tantalizing close ID, just not close enough. For my wife, Jerene, and myself, there is no enjoyment in claiming to see a bird we're not absolutely certain of. The enjoyment comes in clearing seeing and identifying a bird. So both the Vesper and Lincoln from today won't go onto our checklists as such. One day, hopefully soon, we'll get a good look and enjoy our ID much more. The Belted Kingfisher, one or more of which is generally obvious at Morris, played hard to get today. As we neared time to leave though he gave me a good, long view in the new scope. That is also in drawing at top. If I'd been better prepared and it was earlier in the day I would have perhaps tried a watercolor. I also include an unidentified turtle, most likely an Eastern Painted Turtle. I was taken by the way he had both legs stretched out behind him, though I only drew one of them here. Other birds today included our first Yellow-Rumped Warblers of the fall, more Eastern Phoebes, and innumerable Goldfinches. As I said a beautiful day to be outside. This is fall at its best, made even better by drawing birds from life through the lens of a new scope! 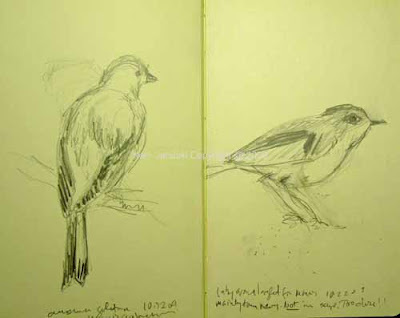 These two field sketches from today at Morris Arboretum won't set any records for good bird sketches. Nonetheless I loved doing them! Today was the first time in a while that I had a block of a time for nothing but field sketching. And it was a beautiful sunny day in low 70s. Most of the first birds I saw were American Goldfinches, but then I started to see Eastern Phoebes, first one, then two, then possibly more. Time to sketch. But like most birds they don't sit still. So I got maybe part of the head down, and then the bird I was drawing moved. Same thing over and over. But this is the important part. Once the bird moved I had no idea how to finish off the drawing. I had only the vaguest notion of what a generalized Eastern Phoebe looked like. How did the whole bird fit together? I had part of the head but how did I draw the rest and still have it look like a Phoebe? I had no idea! I just hadn't really looked closely enough at Eastern Phoebes, even though I've seen hundreds of them in my birding, to have a mental image. More than anything else this is the value of drawing from life I think. You're forced to realize all that you don't know about the mental image of each bird you see, and then you try to do something about it! 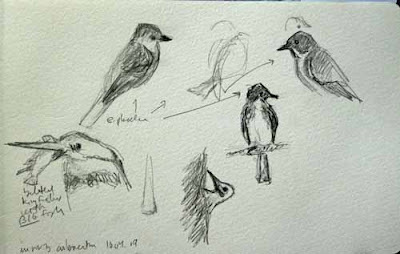 So the Phoebe head on top left is actually based on seeing a number of Phoebes today on various trees and bushes. Each time one flew I realized what I still didn't know about a Phoebe shape and I looked for it the next time I saw one. This went on for 60-120 minutes. I still don't have a fully formed mental image of an Eastern Phoebe but when I started today I had none at all. That is the value, AND the tremendous excitement of drawing from life. I decided to take a break, have my lunch of apple and cheese, sit down on my portable stool, and set up the scope to match my lower height. I didn't expect to see anything while I did so, especially as I moved to a shady area where I'd seen few birds but which would be comfortable. 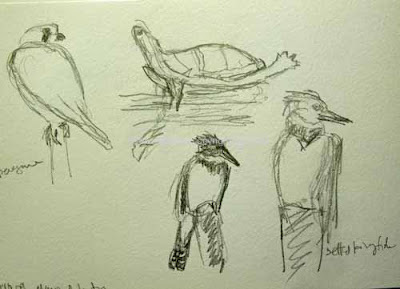 As soon as my hands were greasy from the cheese I heard the rattle of a Belted Kingfisher. There in front of me, centered in the scope, was a Belted Kingfisher, trying to eat a fish that was too big for him!! That's the drawing at lower left. I was so focused on getting the bill right, with fish in it, that I completely missed the crest. Was it not up as is usually the case? If so why didn't I draw it? I have no idea and only noticed the problem when I showed the drawing to my wife when I got home. But that's really no matter. It will be harder to do any sort of finished work from this, but not impossible. The important thing is that because I got so involved with trying to draw what I saw that I have an emotional attachment to it, something I don't think occurs when I take photos. I had my camera with me, but I'm much happier that I tried to draw this struggle of Kingfisher with oversized fish rather than snap a few photos. 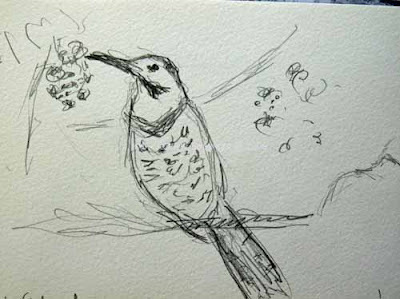 The last drawing on page is a Northern Flicker whose head just barely peaked out from behind a tree. Even this was instructive in getting me to see the curve of his bill. Not that I got it right in this or the next drawing. But it made me uncertain enough to do more research when I got home. As I got to my last half hour before I needed to leave a large bird landed clumsily in a tree not far from me. Cuckoo!? No, the loud clumsy arrival made me think so but it was another Flicker. That is the bottom drawing. He remained in front of me for a long while but constantly changed position. So the first pose I sketched in never really appeared again. Now the tail looks odd. Again no matter. I drew what I saw and kept using the additional knowledge I gained from each new look to try to improve the drawing. Among the things I noticed: all the spots on a Flicker's breast. Though I've also seen hundreds of them I'd never really focused on this. What I didn't notice: what the underside of the tail looks like. I got the shape but he'd moved before I saw the color. Only when I got home and noticed the beautiful drawing of a Northern Flicker that graces the front of the newest version of Roger Tory Peterson's field guide did I see that the dark I saw is only on the outside of the tail, especially at the bottom. So all in all these sketches are mainly a record of what I don't know. That should be depressing. Instead it's invigorating! I'm starting to learn to really look at birds. 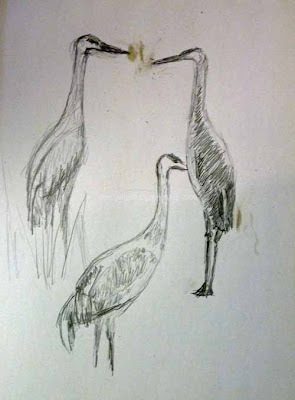 And that's the way to do high quality drawings and paintings of birds. 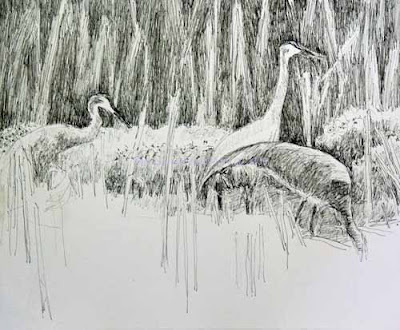 I'd encourage all bird artists to spend more time on it! 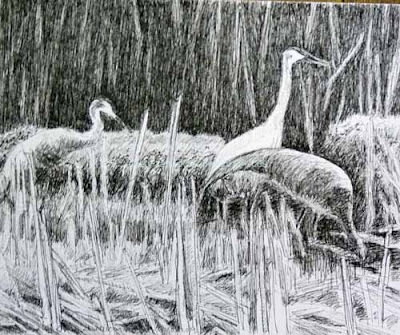 Well this has not been an easy or comfortable finish, but I think the Sandhill Cranes are done. This has been a constant struggle in balancing the muted gray background with a brighter, more color-saturated middle and foreground. Getting the middle and foreground too color saturated early on is what led to my use of sponging. Since then I've tried to add a little more color without making it too brash compared to the background. Also I wanted to keep it somewhat true to what I saw: early morning mist subduing most colors but a certain amount of brightness in the foreground. I think I've succeeded. It's been an artistic adventure. Sponging is new to me and generally I don't like it in watercolor. But it seemed worth trying here and I'm happy I tried. An artist needs all the tools he can get and now I have a new one! In the accompanying photos the top photo is the finished one. The other one shows it just before a few final touches. 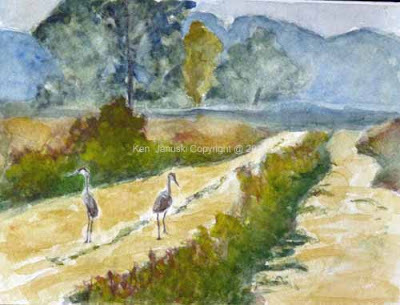 I went back into yesterday's watercolor of the Sandhill Cranes. I always expected to do this since yesterday was just a start. Still I knew that I had a freshness yesterday that might disappear with more work. 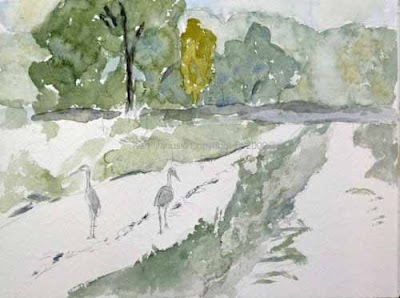 Well I hadn't gotten far today before I realized that I used too many full strength colors and that the painting had become far darker than I'd intended, especially since when I'd seen the cranes much was enveloped in a blue-grey early morning fog. So out came my new natural sponge. I often don't like watercolor with a lot of sponging but sometimes it just seems necessary and seems to work. However there is a fine line between subtle luminosity and mud! This still needs more work. When I next look at it will probably be clear whether luminosity or mud has won. 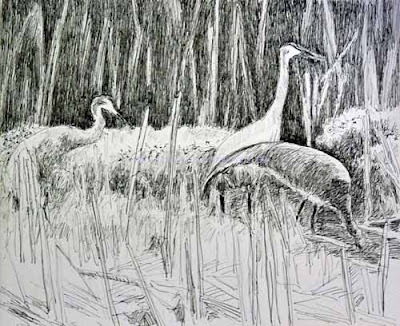 One of the greatest pleasures of our recent trip to the Midwest and particularly Wisconsin was all of the Sandhill Cranes we saw. I was only able to do one sketch, immediately above, but did manage a lot of photos. 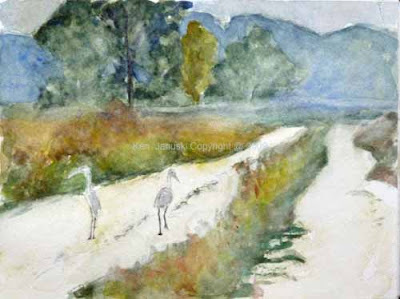 I've just begun the watercolor at top based on photos of Sandhill Cranes walking down Dike Road at Horicon Marsh. 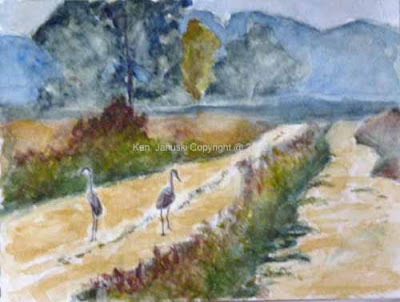 Most of the cranes we saw were in fields or in flight. But I was particularly struck by this pair and another casually strolling down the road.